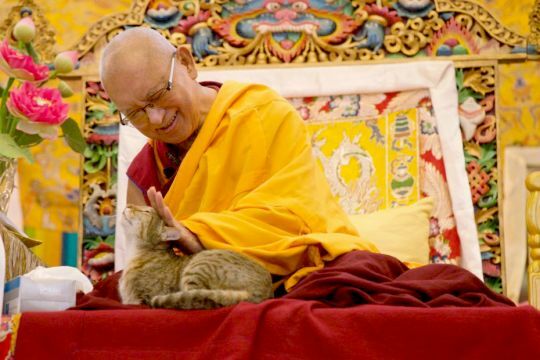 Lama Zopa Rinpoche gave the following advice to a student who had asked Rinpoche how to benefit a very sick twenty-one year old cat. My most dear, most kind, most precious, wish-fulfilling one, I heard you wanted very much to come here but you have a cat that is twenty-one years old and is very sick, so you couldn’t come. I understand, that’s very good taking care of the cat. It’s good to recite Maitreya Buddha mantra in the cat’s ear. That causes the cat to never be reborn in the lower realms, to have a higher rebirth, and to meet the Dharma. Also recite Medicine Buddha mantra, Chenrezig Buddha mantra, Milarepa Buddha mantra, and Lotus Pinnacle of Amoghapasha mantra: OM PÄDMO USHNISHA VIMALE HUM PHAT. Recite these mantras several times each day. 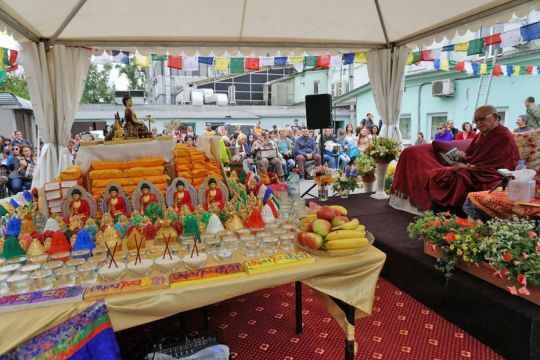 Lama Zopa Rinpoche at an Animal Blessing Day organized by Ganden Tendar Ling with relics, circumambulation of holy objects and altar table, and more, Moscow, Russia, May 2017. Photo by Ven. Lobsang Sherab. Also recite the Three Principal Aspects of the Path and different lamrim prayers. The most important thing is to take the cat around holy objects. If you can, make an altar on a table and put many holy objects on the table, piled up—tsa-tsas, buddha statues, pictures, and texts, then take the cat around, on the same level as the altar. Put pictures of buddhas, statues, and tsa-tsas, as many as possible, then go around that. However many holy objects are there—one hundred or one thousand— each time the cat goes around the holy objects, it creates that many causes of enlightenment. It is good to have many tsa-tsas there and to take the cat around them as much as you can before he dies, otherwise there is nothing much you can do. Here is a powa pill. When the cat dies, put it on his crown with butter and honey. Lama Zopa Rinpoche reciting mantras for a very sick elderly cat, Istituto Lama Tzong Khapa, Pisa, Italy, October 2017. Photo by Ven. Lobsang Sherab. It is very kind of you to take care of this cat for twenty-one years. Perhaps the cat could also be a recent family member, for example, if your father or mother died, or sometimes it could be your wife from a past life. It could be anything. Please continue to make your life most meaningful for every sentient being with bodhichitta. Thank you very much. I hope to see you soon.